Mark Snyder live at Zeitgeist Indeterminacies. Photo by Andrew Davis. 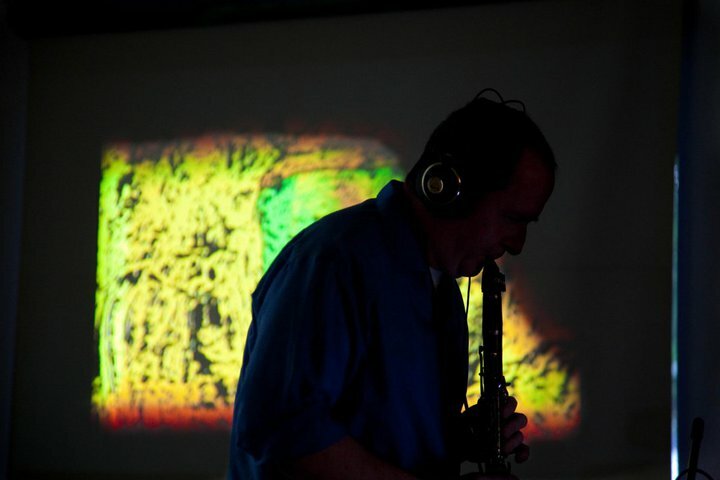 Podcast 58 features composer and University of North Alabama professor MARK SNYDER live at Zeitgeist Gallery on April 12th as a part of their Indeterminacies series. Jonathan Marx was the discussion moderator. Tommy Stangroom live-mixed and recorded the show. He did a fantastic job! Special thanks to Mark, Jonathan, Lesley Beeman, Lain York, the performers, and all the Zeitgeist audience members. Very special thanks to Tommy Stangroom. Photo by Andrew Davis. You can check out more of his pictures from the performance on the Facebook Indeterminacies page. In partnership with Zeitgeist Gallery, Theatre Intangible is recording and releasing future Indeterminacies shows. Next up is MARK VOLKER live at Zeitgest, May 10th at 6pm. Hope to see you there! You can hear the first part in the series with composer STAN LINK here.